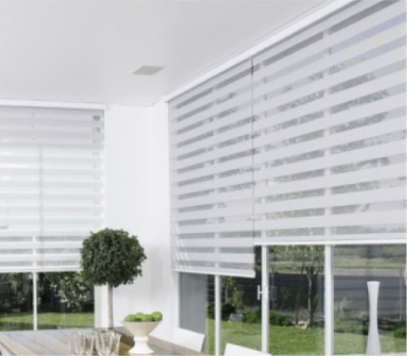 Elegance Blinds are an innovative product that offer the privacy and UV protection. They can be the perfect solution for letting the sun shine in without letting harmful UV rays wreak havoc on your furnishings, flooring and artwork. Elegance blinds are comprised of an internal vane that rotates between two pieces of woven, sheer fabric. Completely open, they provide a view of the outside. Partially to completely closed, they create a warm glow of softly diffused light and utmost privacy, secure from the outside world. When raised, the entire shading disappears into a sleek head rail.